Happy hump day! Between the changing of the seasons and all the traveling I’ve been doing lately, packing has kind of become my specialty! 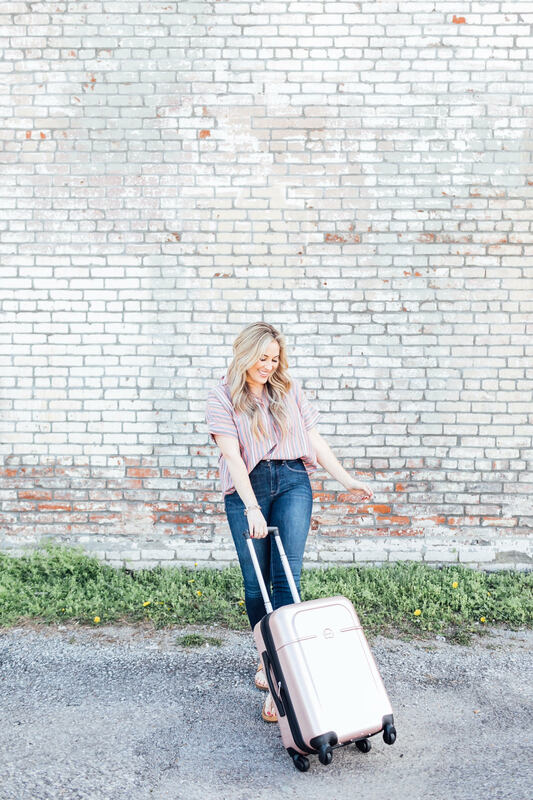 I’m sharing my packing tips for your own spring trip packing list today and keep reading below because I’m teaming up with Delsey today to give one lucky reader this pretty pastel pink spinner carry on! A lightweight cardi, scarf or a denim jacket for those car trips, plane rides or cool nights is perfect. You never know when the rain will come through and cool temps down on your vacation. And make sure most of them are comfy! I usually take a pair of running shoes, sandals, some flats or mules and then one dressy pair. Definitely look for comfort or versatility though. I usually opt for neutrals so they will match everything. 3.) Pack 1 Pair of Jeans, 1 Pair of Shorts, 3 Blouses and 1 Dress. This is usually enough versatility for most trips and will give you enough options without overpacking. And don’t forget you have a cardi, jacket and scarf, so don’t be afraid to mix and match! 4.) Don’t Forget the Workout Clothing and Bikini. You never know when you might squeeze in some time at the hotel pool. And…if you DON’T pack your workout clothing, you won’t workout. At least pack them so you won’t have an excuse not to hit the gym. … so you don’t have to take up too much room and pack them in a separate little bag in case anything leaks. Make sure you tape up tops to help prevent that also! Love your travel outfit! It’s so cute! I need to check out this luggage, I need a new suitcase!! The Delsey Chatelet in Champagne is my favorite! I really love the Rose Gold, it’s lovely. I like the Rose Gold. I always pack a rain coat. Would love a delsey spinner! I couldn’t get the embedded links to Delsey to work. But I love the pink/rose gold color you’ve shown and the dark grey color! OMG NEED a rose gold carry-on– so pretty! I have a weekend trip coming up and will be attempting to pack minimally– definitely using these tips! I like the pastel pink, this will keep my Husband from borrowing and then taking over my suitcase. You look so stunning in all of this pictures. I also love all of your tips. I love the light blue! Great post lady! And an awesome giveaway. Their bags are fabulous! the seafoam one is so cute! I always stock up on my favorite beauty products in travel sizes, too! I like the coral color best! That pink is such a cute color! Sea Foam…perfect for a vacation to the islands! I love the light pink color, it is so pretty. The rose gold is very pretty. I actually love all of the colors! Really need this today to get out of here & the snowstorm we are having. No more snow—please! Need this today to get away from the snow storm we are having today. All of the colors are great but I think the pink is my favorite! I love the anthracite gray color! I love your travel outfit!! I love the rose gold color luggage. love, love that ice blue!! I like the coral but really like the ice blue the most! luv the silver delsey spinner! I love the coral best! Thanks and good luck! I like the pink the best! They are all so stylish, but I’m loving the coral spinner! I like the Sage green color. What a great giveaway – love that suitcase and REALLY need a new one!! All of the colors are fabulous, but I LOVE the PASTEL PINK best!!! All of the colors are fabulous, but I LOVE the PASTEL PINK the best!! I love this luggage. I looked at all the different colors and like the last two the best. The next to the last is my favorite. It looks to be a rose gold but I couldn’t find the names. I like the Anthracite Grey color of the Delsey Spinner. I love them all but I am definitely digging the coral! I like the rose gold one. My fave is the blue. I would definitely get the Seafoam! I like seafoam color the most, although if I was going to get one, I’d probably get anthracite grey to hide scuffs better. ice blue — love it! Love the pink spinner- delightfully girly! And I really appreciate your packing tips. I always pack way more than I need! I like the rose gold. I love the coral spinner! My favorite is the Rose Gold color. I could use some new luggage and I would pick Rose Gold. I lilke the light grey the best. I would pick the gray, because then my husband and I would both use it. I don’t think he’d feel comfortable with the pretty rose gold! I love the CHÂTELET HARD in Angora! So classy! I really like the seafoam color! I love that rose gold but their ice blue is gorgeous, too! I always make sure to pack a tiny umbrella. It doesn’t take up any space and is invaluable! I love love love the pink blush color!!!! I really love the light pink. The mint color is also really amazing. I love the Seafoam Delsey. It’s such a pretty color. I love the Rose Gold all are very beautiful colors though. I would select the ice blue color! I’m going for the gray so everyone in the family can ‘borrow’ this beautiful and sturdy luggage. I love the champagne color, and the pictures are super cute! 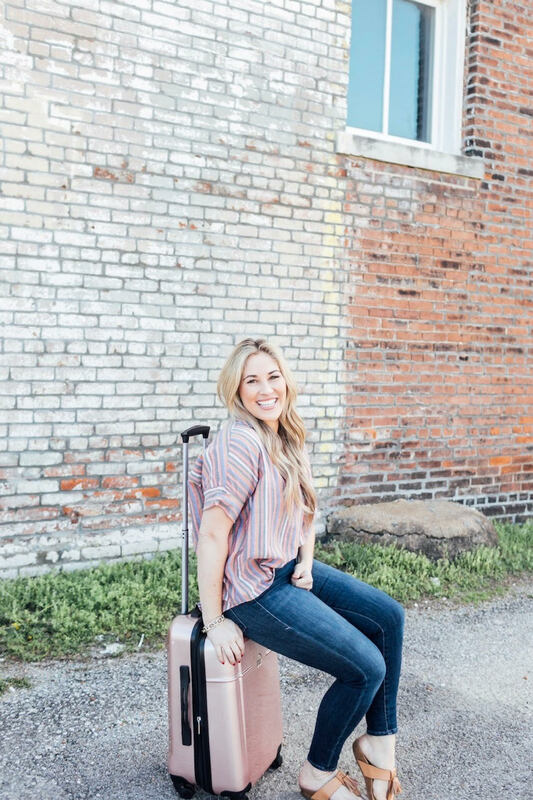 I love the coral color and could definitely use this suitcase!!! All the colors are very adorable! I really love the rose gold! The Rose color is nice! I love the pink color you have in the pics! Honestly it’s a toss up between the Coral and the rose gold. They are both beautiful. i like the living coral or seafoam. thanks! I love the ice blue spinner the best. I love Delsey. I have one but it is old. Time for a new and shinier one. This is perfect. I would love to have the baby blue. DEFINITELY love the rose gold! Rose gold is my favorite, but I love Delsey and would be happy with any! Love the ice blue and the Rose gold the best. Love the pink carry on as shown! the outfit is so cute!! i really need a sturdy new suitcase!! I overpack and yet never have what I need! Love this! I would choose rose gold. I would like the Rose Gold one. I love the Living Coral color! The grey works for me! There are so many nice colors but I love the pink. Need This luggage right away! I love the light blue. The coral color is my favorite. I like the grey spinner. I would love the light blue spinner. I love the rose gold color the most! I love the Anthracite Grey! I like the gray color. I love the Infinite Sand color! What awesome luggage! I love your outfit, as well! I really love the rose gold, but I think I would go for the Ice blue! Love the look. Would be great to take while visiting the grandkids. Rose Gold and Ice Blue are the cutest! I love the coral color. I would love the anthracite grey. Such a great list of tips! I always end up overpacking. I have a bad habit of that. With your tips, I am going to try my best to pack way lighter but still packing the essentials! Thank you! Going to Italy! Just need a suitcase! I like the anthracite grey. My favorite color delsey spinner is the coral! These look so nice. I love the coral. The coral color is so cute!! The rose gold is fabulous. I think I am in love! I sure would love that spinner case. The rose gold is very pretty too. My wife likes “salmon”. Got to keep mama happy! I really like the Living Coral color. That pale pink color is beautiful! I like the ice blue. Lovely tips dear, and yes! Never forget about the bikini! ha! Anyway, cute suitcase you got there! I love the Ice Blue. All of the colors are nice though. I would also pick “Sand”. I absolutely love the Rose Gold! And just in time for my big trip in June! Would be awesome to win we have been doing a lot of traveling looking at colleges with my daughter! Normally I like pink, but this time I think I’d have to go for the Ice Blue. What a gorgeous color! This is a nice piece of luggage. It would make a nice gift. The anthracite grey is slick looking. Thank you so much for the opportunity! Delsey always has the most cutest luggage. That pink is just stunning! I love black or blue the best. Ooh! So cute! And I love the champagne! Super cute! I need to take a vacation just to have an excuse to buy new luggage! I prefer the light green color. Great colors! Think I’d pick the Rose Gold! I like the A, Gray one couldn’t remember the first name of it. Rose Gold is a winner for me!!! i like the light blue color! The Rose Gold is so beautiful and fun. I love the Seafoam Delsey Spinner. Great packing tips! I always overpack. Love the color of this suitcase too. I love the seafoam one!! I like the rose color. I like the living coral color. I love the rose gold suitcase. I’d love to have one! what a great carry-on. good color. I like the Ice Blue color best. I like the Rose Gold color the most. A great quality luggage piece that has spinners that make it easy to move around with. I like all the colors it is available in too. I especially love the Rose Gold color. I could definitely use this when I will be walking in Memphis this June! I like the silver/gray one. I like the silver color! I like the blue spinner because it reminds me of Disney colors. Very cute luggage, I am due for a new piece. I like the pink one. I like to carry a bathing suit. I really love the Ice Blue, but I love the Rose Gold too! I would probably go with the Ice Blue! I really love the Ice Blue, but I love the Rose Gold too! I would probably go with the Ice Blue because I am partial to blues. I love the luggage in gray color! Would love to spin my way to a destination trip! I just love the pink!! Signature color, signature luggage! I really like the Rose Gold such a pretty color. Love this soft pink suitcase! Very fun & girly, and easy to spot on the luggage carousel! I love the colors and the style. Very modern and functional. With the outstanding colors be easy to spot on luggage turn style. I like the seafoam color. I would definitely get rose gold! super cute! My favorite is the DEVAN 24 inch hardside spinner, had my eye on that for a few weeks since the wheels just went on last spinner, I am on a mission for a new one! I really like the Living Coral color! Rose Gold. Or Living Coral. Love them both. The beautiful coral color is calling my name! I think the Seafoam color is absolutely scrumptious! I love the Spinner Carry-On with Bonus Duffel Bag in seafoam! I like the Living Coral color the best. I always carry an inexpensive book for long delays. If I lose it, no big deal. I would love the Living Coral color. It’s so pretty! I like the Anthracite Grey color. i love the rose gold color . The Coral is my favorite! I like the Living Coral the best! Pack my shoes in the hotel giveaway shower caps to keep dirt and germs off my clothes. These look like great suitcases. The blue one is my favorite. I love the rose gold so much! this would be an excellent piece to travel with. I love the rose gold carry on. Love your tips too. I always bring a hat because sometimes the weather doesn’t cooperate and I put it on instead of curling my hair. I love the pink(blush) color…it’s beautiful! I’m a rose gold girl! I think living coral is best. I like the charcoal gray color. I like the Ice Blue best. I hope this comes in black! I always loved the white Delsey suitcase but the rose gold is gorgeous too! I like the Grey color. I love the Living Coral! Thank you!! I can’t decide between the Rose Gold and Anthracite Gray! I like the classic look of the grey! I love the coral but would be happy with any of them! I’m loving Ice Blue the best! They are all gorgeous colors but I love Sea Foam. I love the mint green. I like the anthracite grey color a lot. I love that sort of charcoal gray color. Very versatile. I love the light pink, it’s my favorite color right now! I really like the gray/silver color. The red is nice too. The living coral is beautiful! The seafoam & the rose gold are both so pretty! I like the rose gold the best. I like the rose gold color. I love the infinite sand spinner. I LOVE the Rose Gold! So unique! I really like the living coral. I really love the color of the DEVAN luggage spinner! I love the anthracite grey color. It would be versatile for any of my family memebers. I am in love with the Rose Gold spinner! My Favorite color of the Delsey Spinner Carry On is Living Coral. So bright and fresh looking! I love the living coral. I really like the Anthrocite Grey. this bag is simple and nice looking, a big fan of the light gray and blue. I really like the seafoam it’s such a pretty mint color. i <3 the rose gold! My favorite is the pink one like you havein the pictures! ANTHRACITE GREY is my favorite color for the Delsey Spinner! I would love to win a light blue one. Reminds me of all the visits to tropical vacation spots like Jamaica and Fiji! Ian ready to pack and go! The rose gold is my favorite color. I love all the colors, but the Rose Gold is the prettiest. Rose gold is BEAUTIFUL! Thank you for this opportunity! Ice Blue looks very nice! The Anthrocite Grey is my favorite color. I love Mint Green the most. It’s so subtly pretty. What a gorgeous bag. I love the grey color so much. Living coral is very pretty. I like the color rose gold! Great tips! I’m a notorious over-packer and am always looking for suggestions on how to fix that. I really like the Seafoam color. I would choose the ice blue. Thanks! I like the Anthracite Grey! My favorite is the Anthracite Gray. I like the Ice Blue spinner. Delsey Spinner in Ice Blue. My college student daughter loves the Anthracite Grey color !!! The color Delsey Spinner I love the most is Rose Gold. Thanks for the fantastic opportunity to win! I am crazy about the living Coral! I love the light mint green, its really nice! The Rose Gold is my favorite. The seafoam is my favorite color but I also love the coral and ice blue! Thanks for the tips! 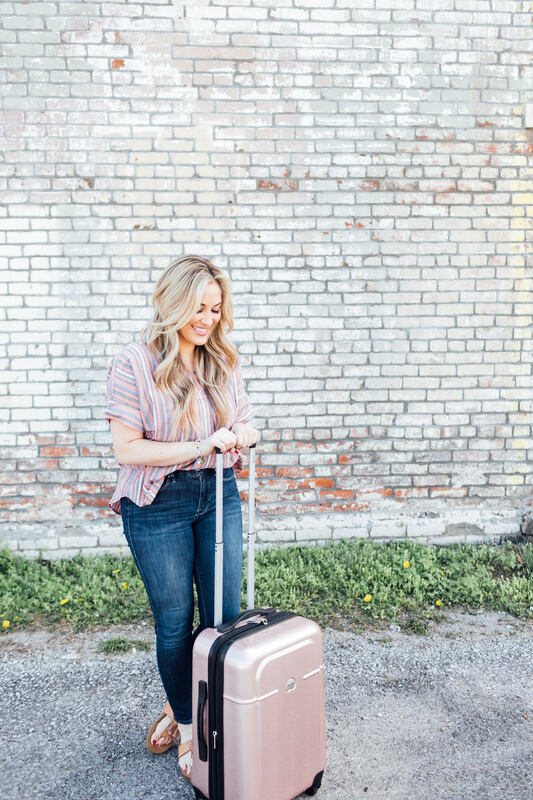 I’m headed to FL and these tips will help with my packing! WoW! So so purdy!!! I love the Ice Blue! I like all the pastel type colors. Blue is my favorite if I had to pick. I like so many of the colors, but Ice Blue is my favest fave. Thanks! I would love a Delsey Spinner suitcase in dark gray! It is a color that goes with so many others and my boyfriend can also use it if he needs it! I like the seafoam color actually they are all really nice colors.